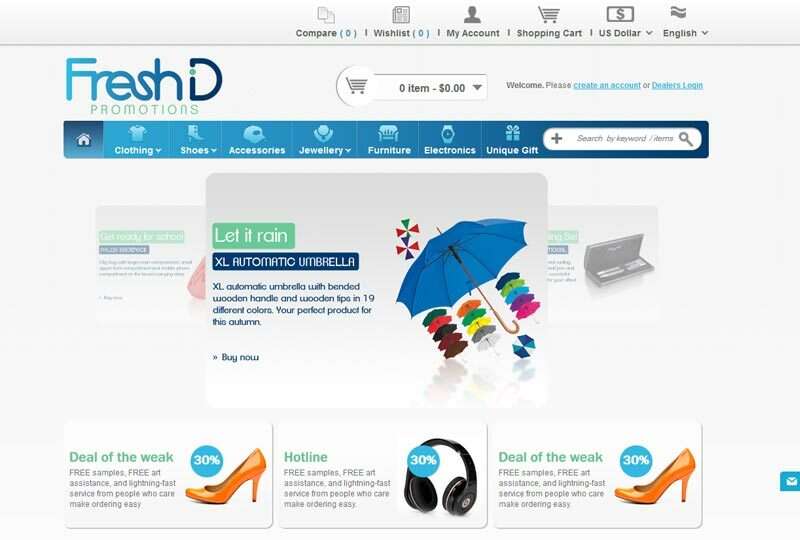 FreshidPromotions, is an eCommerce Website which provides its users the facility of Shopping Products with ease. It allows users to browse and search products with the help of Advanced Search feature. Users can select the Currency in which they want to shop the Products. For the selected Product, users can check its Shipping Price by entering their Postal/Zip Code. Users are availed the facility to make payment over site via Standard PayPal, Visa, Master and Amex Credit Card. After placing the order, users can Track their Order as well. The website was released as its First version in September 2013 followed with its Second Version in December 2013. As a reliable partner to support an ongoing program for enhancements to the website, its upcoming third version is under progress and will be released soon. Marc (Our client) said: “After we received the scope, we started and everything went smooth. But with the first scope finally we could not go online. Everything was very professional, but if the scope is set up once, it has to be checked very clearly before they start. No more major changes can be made. Some stuff was expected from us already, but was not explicit mentioned in the scope, so we could not change it anymore. But in the end, they did a good job, which could be related to my given stars. I can recommend them for any kind of web page development.” We continues to provide expertise and services in support of FreshIdpromotion’s ongoing program of website development.